Is it just me or do Warriors seem to be lacking when it comes to weapon traits? 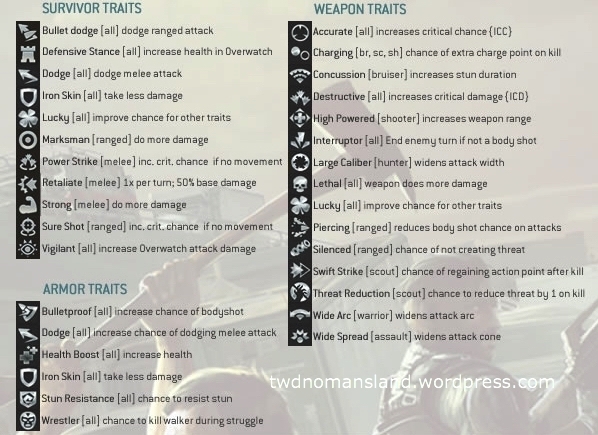 Other classes have some pretty awesome weapon traits that make them very valuable. Other survivor classes have traits such as Charging, Concussion, Piercing, Swift Strike, and Threat Reduction. Warriors have only pretty basic traits with the exception of maybe interrupt. It would be nice if NG would add some traits to Warriors weapons to make the useful again. Either that or let them be able to have Swift Strike and/or Threat Reduction on their weapons. I have stopped using my Warriors for this reason. At the risk of sounding like a broken record (sorry everyone): It would be nice if the Warriors' bonus attack wasn't total garbage. Not being a guaranteed critical is already bad enough, but to have the Warrior bonus do 75% of the damage of a normal, non-critical attack? That's just BS.